Happy International Picnic Day! Yes, it's that time of year again - time to pack up those picnic baskets, ice-filled coolers, and extra-large blankets and head to your favorite picnic spot. Whether you head to the beach, the park, the mountains, or your own backyard, it's hard to go wrong! Now, you may think me strange for bringing ice pops to a picnic, but it wouldn't be the first time. I've loaded up a midsummer's picnic featuring wine with some luxurious Sauvignon-Peach-Vanilla Ice Pops, and these Apricot Chamomile Popsicles have even made their way into a past picnic day post! What can I say? I love my popsicles. This year, I decided to go all the way down to Y, which could only mean one thing in ice pop land - yogurt! 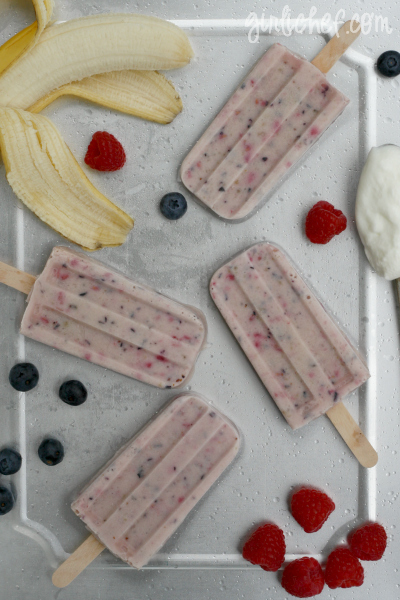 These simple frozen treats are just fruit, berries, and honey blended with yogurt and frozen. So, not only are they a delicious way to cool down at the end of a warm outdoor picnic, they're also good for you. What more could a person ask for? I've paired up with other bloggers from the Sunday Supper family, and today we are celebrating International Picnic Day by bringing you a basket packed with goodies from A to Z, in the style of the picnic game! Drop by the Sunday Supper Movement to see the whole picnic spread out on our virtual blanket. 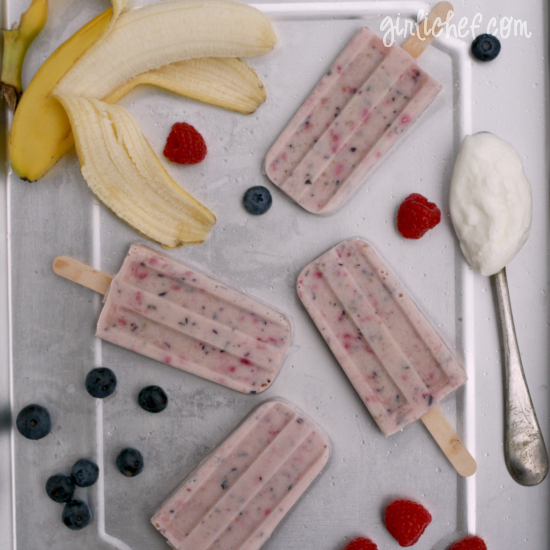 Yogurt Banana Berry Ice Pops! 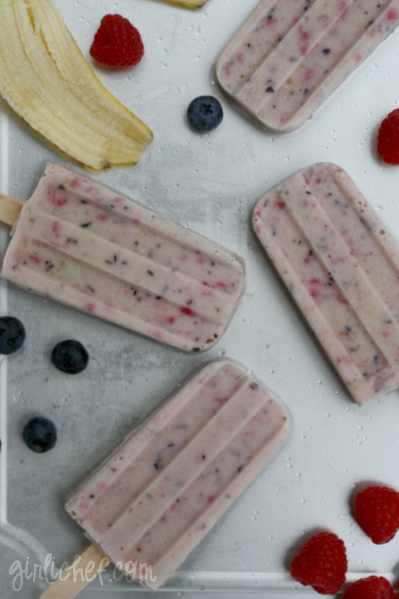 Creamy yogurt ice pops loaded with bananas ans fresh berries. Combine all of the ingredients in the jar of a blender and pulse until almost smooth; a few small chunks of berries and bananas are nice. 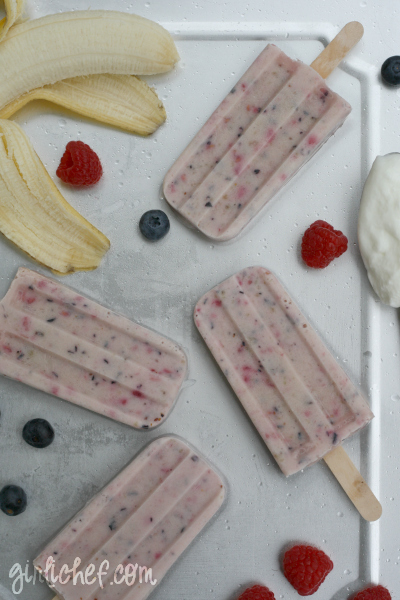 Pour into popsicle molds and freeze, adding sticks after 90 minutes or so. To take ice pops on a picnic, remove them from the molds and wrap individually in wax paper. Slide them all into a freezer-safe bag. Store the freezer bag in a small cooler filled with ice or dry-ice (follow dry-ice safety instructions). Slide the small cooler into a large cooler or picnic basket, if you like. I hope you'll move on to see the next (and last) letter of the alphabet - Za'atar-Spiced Chickpea and Freekeh Salad. You can see the entire picnic basket from A to Z at the Sunday Supper Movement website!